Much like a medication, strength training has an ideal dosage. For medicine or strength training, too little fails to provide a benefit. On the other hand, too much can be toxic. To achieve results with no negative side effects, a middle ground should be achieved. The question is…what is that middle ground? In terms of frequency, how many days per week should people train? According to a research review featuring 107 strength training trials, training 1-2 days per week is not ideal for experienced trainees (1). Studies which compared this frequency to higher training volumes showed a greater frequency was needed to maximize muscle and strength gains. Several strength training studies in another review showed the same result: training one or two days each week was consistently topped by greater frequencies (2). The conclusion: strength training 1-2 days per week helps beginners see progress, but more is needed for veteran lifters (1, 2). What’s “too much?” Let’s detour for a moment and answer another important question: why is training “too much” detrimental? Strength training is obviously known for its ability to increase strength and muscle size. However, strength training doesn’t instantly create those changes…the workout is merely a stimulus for change. The actual changes happen in the days after training. This is why adequate recover periods are important: they allow the “gains” to happen. Without enough rest, training will actually cause a plateau in strength and muscle. For example, one study showed women who trained the same muscle groups twice in three days were actually weaker in the second session (1)! In addition to halting progress, training too frequently also causes a weakened immune system, negative moods, and persistent fatigue (3). To avoid these issues, a rest period of at least 72 hours is recommended before training the same muscle group twice (1). For example, if the lower body is trained on Monday, another lower body workout should be performed on Thursday at the earliest. A frequency of 3-5 workouts per week is considered optimal with each muscle group being trained around twice per week (1,2). The challenge with this frequency is, if you’re like me, you have kids, travel, work obligations, and other factors that get in the way of visiting the gym most days of the week, every week. Even when the gym is on my schedule, last-minute events can often take precedence over the gym. The RigRack allows more flexibility in my schedule. 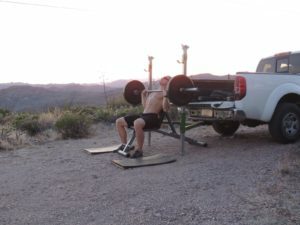 It takes less than five minutes to set up, allows me to train in my driveway, on the road, or in any random patch of dirt (as you can see in the picture above). The RigRack also doesn’t close at 10 PM (unlike a few local gyms). By circumventing these obstacles with the RigRack, I am now consistently reaching my target training frequency, allowing my body the recommended balance of training and recovery. Your body responds to exercise similar to how it responds to medication: a threshold is necessary to make progress but too much can cause harm. To reach your strongest and most muscular self, train 3-5 times per week. Kraemer, W.J. & Ratamess, N.A. (2004). Fundamentals of resistance training: Progression and exercise prescription. Physical Fitness and Performance, 36(4), 674-688. Tan, B. (1999). Manipulating resistance training program variables to optimize maximum strength in men: A review. Journal of Strength and Conditioning Research, 13(3), 298-304. MacKinnon, L.T. (2000). Overtraining effects on immunity and performance in athletes. Immunology and Cell Biology, 78, 502-509.